Guardians of the Galaxy's Groot suddenly pops out of his pot after "Pop! 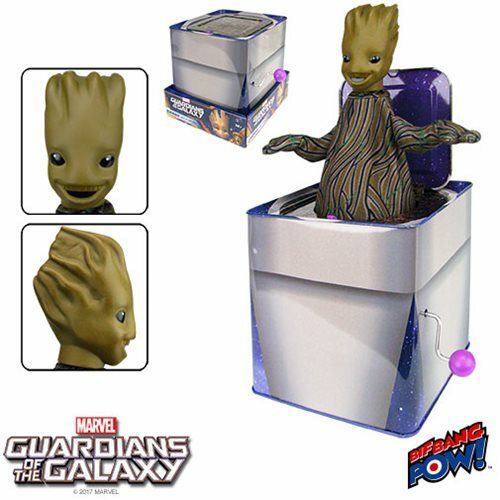 Goes the Weasel" plays when you turn the crank on this highly entertaining Guardians of the Galaxy Classic Groot Jack-in-the-Box from Bif Bang Pow!. The potted Groot figure features a detailed plastic head and fabric body, and the retro tin jack-in-the-box replicates the sentient tree-like hero's flower pot, complete with "soil"! It measures about 5 1/2-inches tall x 5 1/2-inches wide x 5 1/2-inches long. Ages 14 and up.